Keeping your microchip information up to date greatly increases the chance that you will be reunited with your dog if he is lost and scanned. Be proactive! Ask your veternarian to check your dog’s microchip during his annual examination. Write down the number of the microchip and the name of the manufacturer and keep it in a safe location (preferably in your phone). This way you will have it handy if your dog goes missing. You are unsure that your dog’s information is up to date. Your dog should be registered to YOU with your current phone number and addresss. A shelter, rescue, breeder or pet store may be the secondary contact but you should be the main contact. You want to be the first person they call when your dog is found. Also, shelters, rescues, breeders and pet stores go out of business. Their records (including your contact information) may be lost, destroyed or unavailable. 2. Your dog goes missing. 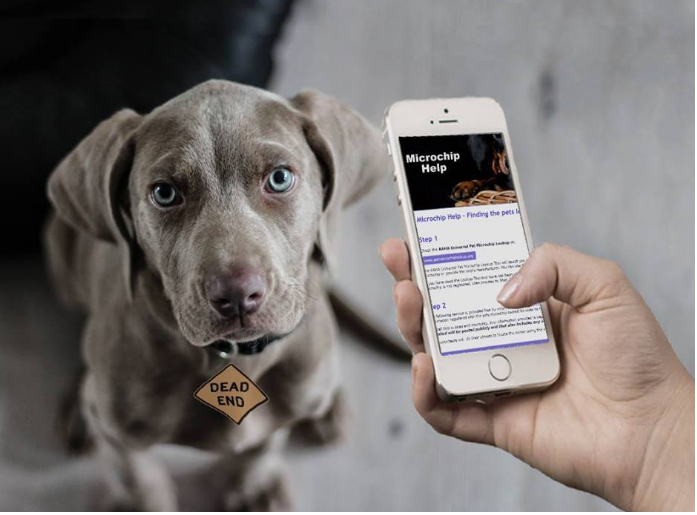 The microchip company will “red flag” your dog and note that he is missing. They may also put out alerts on your behalf (but there may be an additional fee for this service). Create a FREE lost pet alert through our software partner Helping Lost Pets by clicking here. Many dogs with out-of-date microchip information are adopted into new homes or sadly euthanized. If your dog is adopted to a new home, you will probably have to pursue a civil case to try to get him/her back. You may or may not be successful and it may be costly. Don’t let this happen to you! A microchip is only as good as the information connected with it. Did You Find a Pet With a Dead End Microchip? We can help! Lost Dogs of America and HelpingLostPets.com are pleased to announce another FREE Service to help pets home. This service is available to shelters, vet clinics and the public. Have you Found a Dog that has a DEAD END Microchip? This means you have tried to contact the owner through the information registered to the chip and you have reached a dead end. Here’s the website that will allow you to submit the microchip # and the pets info so that we can attempt to find the owner. Contact us even if the chip was not registered.